It’s a fact: summer is almost behind us, and a new school-year is starting. There’s no use denying it, so you might as well celebrate it! We’d like to help. In fact, we have a few things to celebrate. Anyone can win a Voki t-shirt, and we are giving away plenty. You can wear them when teaching with Voki, or give yours away to a lucky student (or save yours in the hopes of one day auctioning it to the highest bidder…)! Tweet about why you love Voki, or how you use Voki in the classroom (add #VokiTee4Me). Important: Make sure to include #VokiTee4Me at the end of your tweet so we can find it! 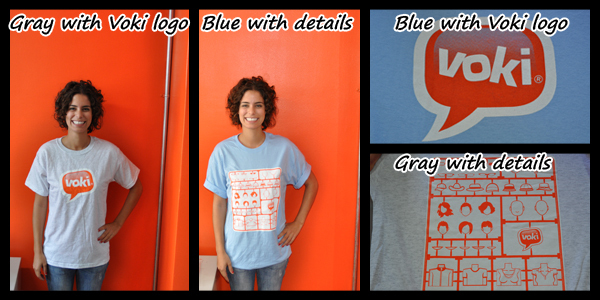 Which Official Voki T-Shirt will you choose? After every weekday (M-F), from Monday, September 5th to Friday, September 16th, 2011, we will randomly draw three (3) winners who have completed the 3 steps above during that day. If you are selected (and if you have completed the 3 steps), you win! More Tips: Every day is a new day, meaning you can send out a different tweet each day and you’ll be in the running for that day’s selection. You can also send out more than one tweet per day, as long as each tweet is different. To be fair, each person can win only one (1) Voki T-Shirt. If and when your name is selected, we will contact you via Twitter (via @ mention or DM). We’ll ask you to email us your info and we’ll send you an Official Voki T-Shirt! We’ll even pay the shipping! Good luck to everyone and here’s to a great start to the new school-year!